Have A Broken Garage Door Spring? This article is aimed at providing an overview of garage door springs. Including; varieties of garage door springs, the risks associated with each, and the feasibility of DIY replacement. This is NOT MEANT AS HOW-TO DIY INSTRUCTIONS. This is only VERY BASIC overview on spring types. Extensions springs store energy by stretching or extending (thus the name). As the door begins to close, more and more weight comes off of the horizontal track and adds tension to the stretching extension springs. There are always two extension springs per door. One located on on either side of the door, running parallel to the horizontal tracks. Each spring provides tension, independently of the other, to opposite ends of the door. Some mechanical advantage is offered by metal pulleys. This, sometimes uneven, distribution of force can sometimes lead to a door that “walks” up and down the opening. When one side of the garage door seems to lag behind the other (while opening or closing); adjustments aimed at balancing the spring tension can help alleviate the problem. Torsion springs can vary in number(1-4 per door). With the number and strength dependent on door size and weight. Torsion springs are installed, over a metal shaft (that spans the width of the door), directly above the door opening. After the springs are installed, aluminum drums are placed on each end of this shaft. Cable length and drums are set; then, the torsion springs are tensioned (or “wound”) and each piece of the assembly is locked into its relationship with the others (via set screws). The total force exerted, by every torsion spring in the system, is equally distributed across the torsion shaft. Then, the force is transferred to both drums; which spool (or un-spool) the cables at a, theoretically, equal rate on both sides. This eliminates the “walking” that can occur with tension springs. Should I Be Worried About My Garage Door Springs Breaking? Yes and no. The only substantial risks, to life and property, come from extension springs installed without safety retention wires. When either the spring or the cable fails; the results can be explosive and catastrophic (think about snapping a giant “rubber band” made of steel). At 1st Response Garage Doors we’re committed to our customer’s safety; we will add safety cables to any of our customer’s garage doors for FREE. 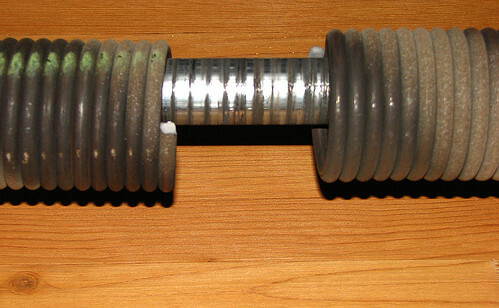 All parts of the torsion spring are retained on the shaft when it fails. The only real danger to homeowners comes from trying to tension torsion springs without proper tools and knowledge. The consequence of trying to undertake such a foolhardy task is potentially life threatening. Tremendous amounts of energy are stored in these springs; ready to be unleashed the instant you lose your grip on a tool or your tool breaks. When either kind of garage door spring is properly installed failures are contained/controlled. Even in the case of a spring failure mid-cycle, the door will wedge itself (quite firmly), between the tracks, and remain suspended in the opening. Are My Springs Going To Break? When? Yes, they will. Unless, you change them first; or never open your garage door again. Eventually your garage door spring will succumb to metal fatigue and fail. The, industry standard, life cycle of new springs is 10,000 cycles. However, springs with longer life cycles can be engineered. Unfortunately, or fortunately, even the dirtiest most rusted springs can still have years of service left in them. Especially if they’re properly maintained in the future. It is nearly impossible to predict when your springs will break. Our usual advice to customers is: use the door until one of your springs break, then replace. In cases where a door has two springs; it’s best to change all springs on the door. Any unbroken springs, of the same age as the broken one, will fail in sort order. Please give us a call if you need help with a torsion spring adjustment or installation. We can take care of the problem safely, quickly and for very little more than it would cost you to do it yourself. Can I Replace My Garage Door Springs By Myself? Most mechanically inclined people can probably manage replacing EXTENSION SPRINGS , themselves, without need for any special tools. Extension springs can be purchased at just about any Lowes or Home Depot in South West Florida. They will set you back about $45 /pr depending on the weight of your door. One tip: start with the door up. We will do an article on how to replace your own extension springs, soon. If you have a garage door with torsion springs; we DO NOT RECOMMEND that you work on any parts that are under tension. If you need to have a spring adjusted or replaced; please call a professional. The time and cost associated with ordering, and waiting for, the required tools and parts (online or via catalog) outweigh the small savings you might realize by doing it yourself..